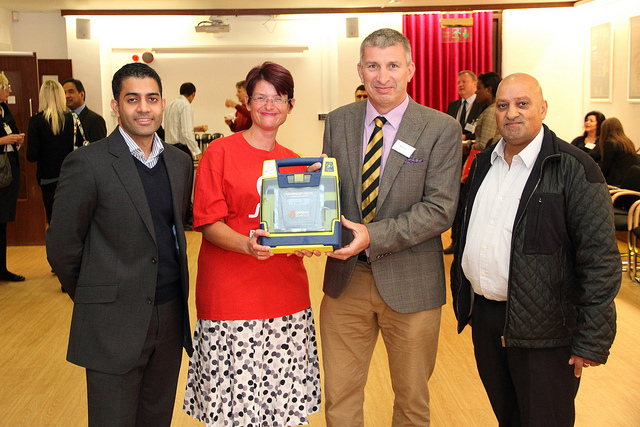 NBC Ltd and NRG Gym who helped cover the cost of 5 new defibrillators for use in Gravesham were delighted to formally present the Defibrillators to Cllr Dhesi and David Hughes, Chief Executive from Gravesham Council . The total cost was £4,200 and following an appeal to local businesses Nick Sidhu of Nick Building Construction, NBC Air Conditioning and NBC Diamond Drilling in Northfleet offered to donate £2,000 and Shafiq Ahmed of NRG Gym, based at the former Gala Bingo Hall, Gravesend Town Centre donated £100. The Council covered the remaining £2,100 and are ensuring staff are trained in first aid and know how to use the defibrillator. These portable machines can give access to the vital life-saving equipment should someone suffer a cardiac arrest. The defibrillators work by delivering a controlled electric shock through the chest wall, to shock the heart back into a normal rhythm and help combat the problem. When someone has a cardiac arrest, defibrillation needs to be prompt as for every minute that passes the chances of survival decrease by around 10 per cent (1). Defibrillators need to be available in areas of greatest risk – areas where there is a high incidence of cardiac arrest and in areas where it is difficult for an ambulance to get there quickly. Mark Jones who was saved by a Defib in May 2013 was present to explain why he is living proof that this equipment is vital. Mark collapsed whilst at Canterbury Rugby Club and said “What should have been a joyous end of season celebration of rugby at Canterbury Rugby Club on the 5th May 2013, instead turned out to be a life changing moment not only for me but for my family, friend’s colleagues and club members. During a substitution in the second half, I collapsed on the edge of the pitch in front of onlooker’s children and teammates. As first aid arrived I quickly fell into cardiac arrest and went grey and very unwell. As fortune had it I was surrounded by on duty medical staff, including staff nurses, trauma, trained policemen and luckily an off duty resuscitation officer for the local A&E at Kent and Canterbury Hospital. Due to their quick and professional involvement, CPR was started immediately and the defibrillator in the clubhouse was called for. I was shocked with the club’s AED twice and a further 3 times once SECAMB were on site whilst CPR was carried out continuously. I was revived and then went via Kent Air Ambulance to William Harvey Hospital where I had a stent fitted to a restricted artery. Then induced into a chilled coma for a further 2 days, brought round and released from hospital the following Friday. There are also more Defibrillators thanks to the BHF and SE Coast Ambulance at the Cyclopark and Ebbsfleet United.